One way to earn InterStellar Kredits (ISK) is to haul (move) goods from one location to another, buying low and selling high. Eve University students can make a good income as haulers, even during wartime, by setting up a hauler alt character outside of the corporation. With this base level of skills, the Bestower will carry 4,800 m3 of cargo, without any modifications. Eventually, with maxed out skills, 4 Expanded Cargohold II mods, and 3 Cargo Optimization rigs, the Bestower will carry a whopping 24,114.9 m3. In short, with an Amarr hauler alt, you can get started quickly, and eventually end up with a very well equipped industrial ship. The economic system in EVE is highly dynamic, driven in large part (but not all) by players, and the resulting supply and demand of goods. This results in disparities in buying and selling prices, resulting in the opportunity for trade routes, where haulers can buy at a low price in one location and then fulfill demand at a higher price in another. The hauler's most valuable resource for finding profitable trade routes is, among others EVE Trade. EVE Trade pulls buy and sell orders from either a single station, two stations or even two regions for station trading or finding trade routes. This gives you a (reasonably) up-to-date look at the markets all over the universe at a glance. The process outlined below will show you how to effectively use this website to your financial advantage. Using this tool, even a starting hauler with minimal skills and capital can routinely earn 300K ISK or more per trade run in high-sec space with virtually no risk. As your cargo capacity and available capital increase, trade runs worth millions of ISK in profit will become routine. Try finding quick, zero-jump trade routes in a high-sec system with lots of stations. This does not have to be in a trade hub like Jita, Hek or Rens. In fact, trade hubs tend to have higher turn-over rates in their markets, making online databases frequently out of date for these systems. If you are starting an Amarr hauling alt, consider a system like Penirgman which has 19 stations and is close to the Amarr starting areas. Zero-jump trade routes won't necessarily be the most profitable per trip, but the trips are very short. Make sure your hauler alt always has enough capital to buy trade goods in sufficient quantity. For hauling consumer and industrial goods, you'll need about 10M ISK to start carrying near-full loads. If you don't have that amount on hand, don't worry - you can carry partial loads and you can earn the necessary capital over time. You'll always want to keep a buffer of ISK in your wallet that is sufficient to fill up your cargo hold if you can. Keep this in mind when you find yourself with enough money to add modules to your ship that increase its capacity, or upgrade your ship altogether. If you spend a significant portion of your ISK on the modules and/or new ship, you won't have enough left to be able to use the added volume. 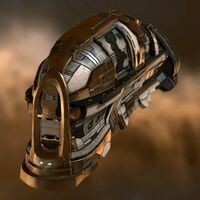 For those that are starting an Amarr hauling alt, your first upgrade to your Bestower will likely be four Expanded Cargohold IIs (~2M ISK) which will increase your cargo capacity to just over 13,000 cubic meters. TODO: Add info how to select a good trade route that is less populated and region trading. When starting out, it might be a good idea to run hauls between the big trade hubs. Because of how the market works, prices are always different at the different hubs. A good and short route is between Amarr and Jita. A one way trip takes just about 10 minutes, which means the risk for someone else spotting the same profit is relatively low. Always check the details of an item to see detailed buy/sell orders and make sure there is ample demand in the destination station. One important factor to consider before selecting your trade run is sales tax. The universal sales tax rate in EVE is two percent (2%), although this can be modified be skills training. EVE Trade does not include the effect of sales tax in its calculations, and this is a potential trap for haulers carrying low margin goods. While the vast majority of trade runs in EVE have more than a 2% margin between the buying and selling prices, it is never guaranteed. Smaller haulers are unlikely to haul low-margin items, since they naturally tend to focus on trading goods that maximize profit per cubic meter (m3) of their very limited cargo space. But freighters, and haulers with very large capacities, are more likely to select larger volumes of goods at lower margins, so they can fill their expansive holds, and they can get caught more easily in a sales tax trap. THIS STEP IS IMPORTANT: Most of the time, EVE Trade provides good suggestions for goods, but it's always a good idea to double-check. Click on the details button (little + to the left side of the respective item) and check how much good buy orders exist at your destination station. You don't want anyone else fulfilling all of them while you are still on the way. Another way to do this is are websites that get up to date market information, like this market viewer. Select your Region in the top left and then search for the item you want to buy or sell. Remember though, that the market in a busy trade hub, such as Jita, can be so volatile that between uploading market data and doing the route search, it can change significantly. One way to avoid this problem is by doing your trading in relatively quiet systems with more market stability. If your trade route ends in a trade hub it might be wise not to invest too much into a single run to avoid huge losses by inaccurate market data. If your trade route checks out, make sure you are in the same station as the seller (they should at least be in the same system). Buy the items that you will haul. There may be multiple sell orders for that item in the station, make sure you get the right one! Note that there may also be some cheaper but at a lower volume than what EVE Trade listed—buy these first! Just make sure you end up with the same total item count in the end. The item will appear in your station hangar. Drag the item into your cargo hold. If it doesn't all fit, something has gone wrong with your math and you will need to make multiple trips. Warp to the seller's system and dock at their station. Go back to the Selecting a trade route section and repeat for the next few trade runs. Using this process, haulers can easily make 1 million ISK about every 20 minutes - sometimes a little more, sometimes a little less. Not a bad return for something that is almost risk free. As warned above, EVE Trade does not include the effect of sales taxes or broker fees on your transactions. It's up to you to remember the potential effect that these costs will have on the profitability of your trades. Fortunately, the 1.5% standard sales tax is not hard to calculate. You can reduce the amount of sales tax by training the Accounting skill - this reduces sales tax by ten percent per level. So, a fully maxed out Accounting V will cut the standard 1.5% sales tax by half, resulting in a sales tax rate of three-quarters of one percent (0.75%). However, the Accounting skill is relatively expensive to acquire (about 4.5 million ISK), so you will have to trade a great deal to earn that back from slightly lower sales taxes. Broker fees will also apply if you use the Advanced option in your market trades to set a specific selling price, rather than selling at available market prices (i.e., selecting the "Sell This Item" option and accepting the offered market price). 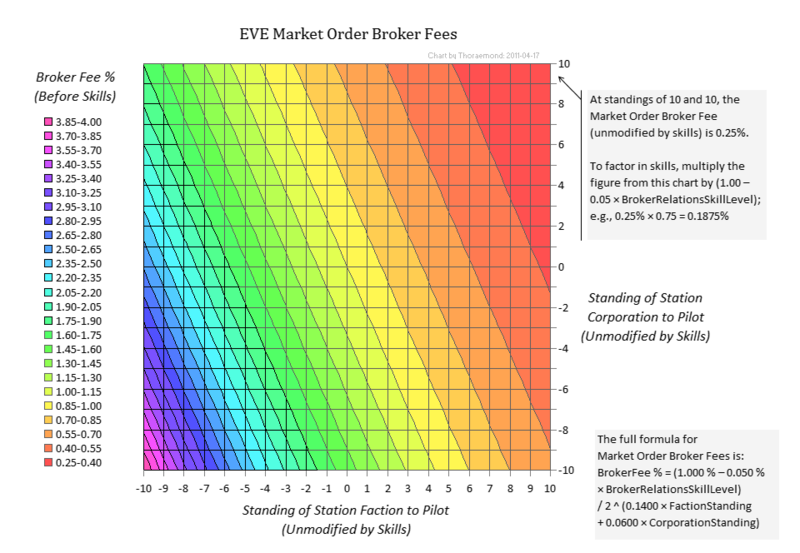 Broker fees are variable and can double your transaction costs, especially if your standing to the faction of the station where you are trading is poor. An illustration of the relationship of standings to broker fee can be found here:  In general, sell at market prices, and don't use the Advanced option when hauling - unless you really know what you are doing, and you believe that your higher potential profits will make the additional broker fee worthwhile. You also have to watch out for suicide gankers, of course. To minimize this risk, don't stock too much value in your ship, don't autopilot, warp to 0 between gates, use insta-docks/undocks and jump manually. And: insure your ship - always. This page was last modified on 17 December 2018, at 10:27.